NORTH LAKE TAHOE, CA--(Marketwired - Apr 22, 2015) - If ever there were a season for living mindfully and healthfully, it would be now. And if ever there were a destination conducive to such transformation, it would be The Ritz-Carlton, Lake Tahoe. Not only is this mountain resort seamlessly integrated into Lake Tahoe's spectacular natural setting, but its latest Spring Spa Getaway for Two package, upcoming Wellness Weekend and seasonal spa specials make it easier than ever for guests to find rejuvenation. Available May 11 through June 18, the Spring Spa Getaway for Two puts a sumptuous spin on rest and relaxation. Guests begin their adventure with deluxe accommodations at this Northern California resort, featuring 400-threadcount bed linens, tech-friendly features and full marble bathrooms with oversized tubs. While hotel guest rooms invite visitors to linger, the 17 treatment rooms at this Lake Tahoe resort spa issue a sign of restoration few can resist. Guests who book the package may enjoy their choice of one Spring Spa Treatment per person, per day, as well as a waived resort fee. The Spring Spa Getaway for Two starts at $399 USD per room, per night. Suite accommodations are also available, starting at $599 USD per room, per night for two guests with a two-night minimum length of stay required. Guests may indulge in our Lake Tahoe spa in other ways this season as well. The Spring Spa Specials, for example, invite visitors to discover a series of signature treatments, including the 50-minute Spring Organic Massage, 50-minute Spring Organic Facial and 80-minute Lake Tahoe Stone Manicure and Pedicure, at a special rate of just $129 USD per treatment on weekdays between May 11 and June 18. The Age Defy: A 75-minute, Age-Defying Body Envelopment and Massage, as well as a 50-minute Revitalize Facial to turn back the clock. The Restorative: A 50-minute scalp and full-body massage, and a 50-minute Signature Organic Facial to help guests rediscover their best selves. The Head-to-Toe: A 120-minute Green Tea-and-Peppermint Manicure and Pedicure, as well as a 50-minute shampoo and style for the perfect pick-me-up. The Sampler: A 25-minute Signature Organic Massage, 25-minute Signature Organic Facial and 50-minute Executive Manicure & Pedicure for those who want to try it all. A true spring-cleaning experience is also available during the Wellness Weekend June 5 to 7, 2015. Under the expert tutelage of Rachel Jackson, a Los Angeles-based yoga instructor and Lululemon ambassador, Nick Massie, the chef mastermind behind www.PaleoNick.com, and Mayberry Athletic Center, a Reno-based gym, guests will embark on fitness classes like fit, yoga and spin; cooking classes; and a geocaching fitness challenge. Guests may participate as much or as little as they desire during the weekend with drop-in rates of $30 USD per class; a Saturday Only Pass for full access to Saturday's events and spa facilities for $150 USD; or the Weekend Package for privileges to the entire schedule of events for $225 USD per person. To learn more about any offering, or to confirm spa or hotel reservations, guests are invited to visit www.ritzcarlton.com/LakeTahoe, contact their travel professional or call Ritz-Carlton worldwide reservations at 800-241-3333. The Ritz-Carlton, Lake Tahoe is the first AAA Five Diamond and Forbes Four-Star resort in the Lake Tahoe area. Nestled mid-mountain at Northstar California, the resort is a contemporary mountain retreat featuring slope-side ski-in, ski-out access in winter and mountain concierge services for golfing, mountain biking and hiking in the summer. Seasonally-inspired, locally sourced California cuisine is featured on the menu at Manzanita, the resort's signature restaurant, The Backyard Bar & BBQ offers traditional barbeque favorites year-round, and Café Blue serves locally sourced coffee and freshly-made juices and smoothies. Located just six miles from both historic downtown Truckee and the North Shore of Lake Tahoe, the year-round destination resort features 170 guest rooms, 23 private Ritz-Carlton Residences, The Ritz-Carlton Spa, Lake Tahoe with a 17,000 square foot spa and fitness center and an inter-mountain gondola that connects the resort to the nearby Village at Northstar. 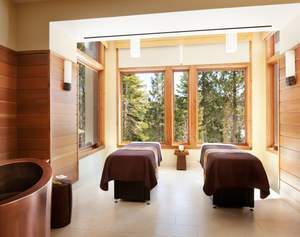 The Ritz-Carlton, Lake Tahoe's latest Spring Spa Getaway for Two package, upcoming Wellness Weekend and seasonal spa specials make it easier than ever for guests to find rejuvenation.